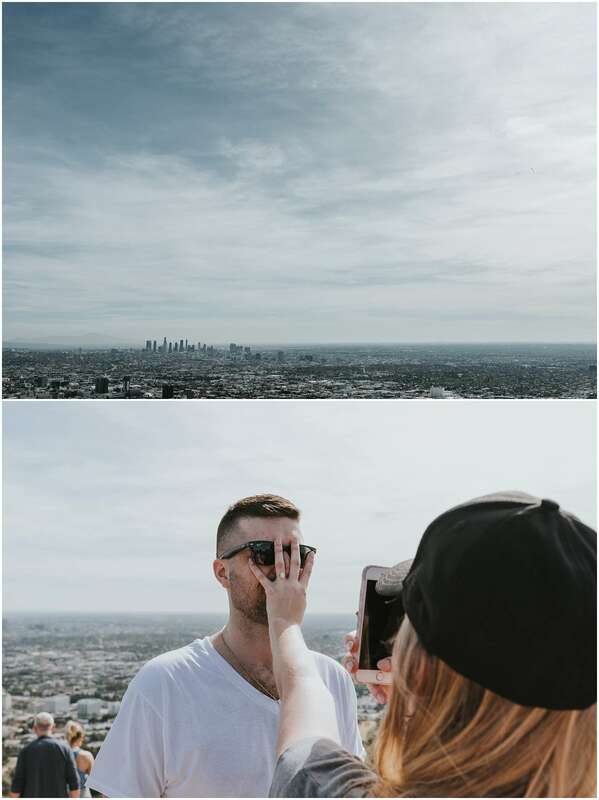 I was so excited to fly out to Los Angeles and help capture Rob’s engagement proposal to Taylor! It was Taylor’s Golden Birthday, so Rob disguised the trip as a fun birthday getaway – but there was a twist! Taylor said she had a feeling he was going to propose soon but didn’t know exactly when. The hike has beautiful views of downtown LA, the Hollywood sign, and Griffith Observatory. It’s also a 130-acre dog park so there were a ton of cute dogs running around! On our way to the top, Rob was scaring the crap out of all of us by climbing up rocks with the ring just hanging out in his pocket. Once we got up to the top, Taylor wanted to take a selfie with Rob using the selfie stick she brought. He pretended to drop it on the ground, but instead of picking it up knelt down to propose! Taylor knew the exact ring she wanted which was made by Forever Artisans, so Rob was able to get the style and design she wanted – it’s perfect! Perfect place for a proposal! Love love the images!! So gorgeous! Congratulations to the couple!